Did you know drumMUSTER supports community groups in their fundraising efforts? There are currently 142 drumMUSTER community groups across Australia who have collected more than 4 million drums and raised in excess of $1,000,000 between them. These include local charities, rural fire authorities, service clubs, school support groups, sporting clubs and Landcare groups. More than 80,000 empty agvet containers have been collected by Kioma State School’s P&C Association. They offer the service in conjunction with Goondiwindi Regional Council. 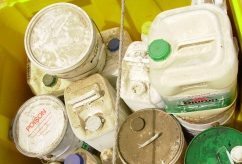 More than 183,000 empty agvet containers have been collected by Dalby Rugby Union Club, which offers the service on behalf of Western Downs Regional Council. This is the highest number of drums collected by a community group in Australia. When farmers and growers deliver their agvet containers to a drumMUSTER collection site, trained inspectors assess each container to ensure it meets recycling standards. drumMUSTER provides the inspector training for correct handling, cleanliness, inspection and storage procedures, plus the reporting required to track the program’s performance at each site. Once a community group’s inspector application is approved, nominated group members will receive training in drumMUSTER inspection processes and the community group will receive a fee for each container that passes inspection. Before approval is granted, collection agency agreements are signed with Agsafe Ltd and all community groups must have public liability insurance and an ABN. If your community group is interested in partnering with drumMUSTER, contact your local regional consultant or call 1800 008 707 for more information.